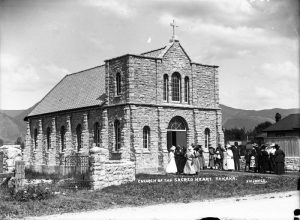 After the earthquake-related building restrictions of 2012, the beautiful, iconic limestone and marble church of the Sacred Heart in Takaka’s main street has been declared unfit for use. To the congregation this is something of a puzzle as the church has lasted since it was first constructed around 1917 and has survived severe earthquakes without mishap. Parishioners have adapted the hall behind the church as an alternative venue for worship. However, it in no way possesses the lofty nostalgic ambiance of the original church – a much beloved and admired building in this district. 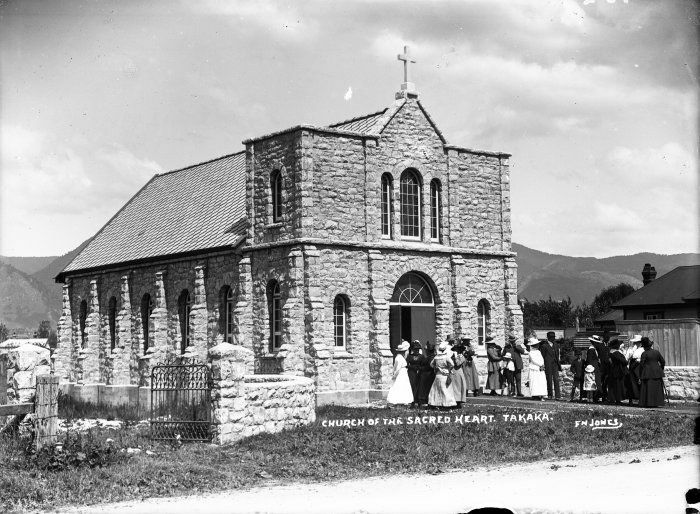 There is a similar church in Motueka, which has been sold and strengthened and is now used as an arts centre. Instigated by Kees Brinkman, a group of parishioners have convened to investigate what steps need to be taken to reinstate the Takaka stone church. Nothing is cheap, and more alternative assessments, geotech and engineers’ re-construction and reinforcing reports need to be done to discover what is entailed in bringing the church to standard. Costs could be daunting. If it is viable to proceed with a structural reinforcement, there will need to be a dedicated fund-raising project. Our parishioner numbers are small so we’d need to search for outside expressions of interest to raise the necessary capital. We’re hoping there may be some geotech and structural engineers sufficiently interested to offer their services when and if required at a reasonable cost. The church was erected by a dedicated parish priest with materials sourced locally and a team of local builders. Our hope is we may be able to move back into this delightful church eventually. Your prayers for our success will be welcome! Please email Mr Kees Brinkman at kees.brinkman@linetechconsulting.com with any expressions of interest to help. Fr Lou Leuthard, whose recent passing was reported in October WelCom, served as a priest in Takaka for many years, where he was very active pastorally for his people and deeply committed to Takaka and its wider farming community. Fr Lou is survived by his brothers John and Walter and his sister Mary.